So I was thinking I should set a few goals, look at a few hills to climb, a few more miles to fear on my regular rides. I've got a few projects too, build a racer - a few bits here and there. loose the pounds, feel the heart pounding a bit more, not be so quick dropping through the gears, let it burn just for a few moments longer. Its good for you. We've got such a big year ahead of us, and its all a bit scary and exciting and did I mention scary? all at the same time. but it'll be fine. The weather has been a bit uneven these past few days, but the weekend promises to be ok, so, a bit of breakfast, a and off out. At least I rode on new year's day - it felt good, it was early and so quiet in the countryside. Good luck to everyone and here I am hoping you'll achieve everything you want to. Is this what July is all about? It feels strange to think this is the last time we'll see the Texan Lance Armstrong racing his beloved Tour de France. I had a few doubts before the opening time trail, but as the big guy devoured Ullrich putting him already a minute behind in the GC so early on, well I don't know how I thought it would be any different. There was a great weekend of cycling on TV, including the obligatory Discovery Channel documentary The Science of Lance Armstrong and documentaries on BBC Four about Paris-Roubaix and Tommy Simpson. Tough luck for David Zabriskie who crashed out in the final few kilometres of the Team Time Trial. After holding the yellow jersey for a couple of days, and the first Team CSC rider to do so, an error caused him to his the barriers and was left behind by his team. Its a real shame, he seems a likeable guy, good sense of humour and a bit of a character, in any case, he's a prospect for the future and it won't be the last we've seen of him. Such a hot day, unbelievable, people melting along the roadside. Stayed in Clapham and had extra portions of Spaghetti once the waiter found out we were cycling the next day. We compared notes on great Italian cyclists, what a great place to eat. The day itself started off hot and sweaty at 8.30am and finished in Brighton hot and sweaty and very tired much later. My computer failed and I don't really have any stats for the day, just to say that we finished in 5 hours, with a few less stops than last time. We really suffered, and I think I drank litres and litres of water in an attempt to stay cool. We were very grateful for all the little kids with water pistols and those kind people who put on their water sprinklers, especially as we approached Ditchling. Again it hurt, again I made it. So, many thanks for everyone who's posted me money, all the dosh we got from work and those kind enough to leave generous donations on the website. So far, to date we raised £186.64 a big thank you. So I've decided to have another go and get trim in time for the big day...and I just recieved my rider number and everything I'll need for the trip. This time we'll be starting early at 8.00am and hopefullly we should have a clearer run and shouldn't have to stop for jams. The great thing is that the clocks go forward on Sunday and I can start training in the evenings and not just wait until the weekend. With the recent move, I've got a chance to find some new loops, and I really enjoy the trip over to Gunwharf on the ferry, crossing water with a bike in tow is a special feeling. 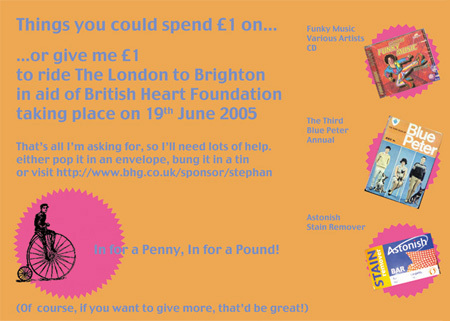 So hit the image above to visit my new bhf page and give lots. Lance Armstrong has moved on from the Five time winners club and set up his own, new club. Only trouble is, that he'll have to wait a while for a bit of company. This tour, more than any others, he has been ruthless and his attention to detail exquisite. Taking seconds on early stages and stamping down his superiority on the big stages, then riding his rivals out of the frame on each time trail. Maybe this is it, maybe there won't be a number seven, but then who'd have said that it would have been possible for a man to win six tours. Awesome. Here are the stats - we did take it easy most of the time, I put in a killer lap towards the end. During my visit to the tour I handed over a shiny Euro and received a little yellow bracelet. This is sold on behalf of Lance Armstrong's Wear Yellow Live Strong campaign which benefits cancer sufferers all around the world. Its amazing how many of these yellow bands you can spot it you're watching the tour. The Lance Armstrong Foundation has a very interesting site, which gives information, including support for people and thier families who are living with cancer.